Dementia is a cruel infliction that eats away at what an individual once was. (Lady) Margaret Thatcher, British Prime Minister 1979-90, was a formidable and highly intelligent woman in her day. Yet, rather than focus on her prime, The Iron Lady highlights the crippling effects that the illness has had on Lady Thatcher in her more recent years. ‘Young Margaret’ (Alexandra Roach) standing for election in Dartford (in 1951). She was then the only female Conservative candidate across the country. The film is about Lady Thatcher (when young played by Alexandra Roach – Private Peaceful; when middle-aged and old played by Meryl Streep – Sophie’s Choice, The Devil Wears Prada, Suffragette), elderly and suffering from delusions and dementia, glimpsing back, at random, at the happy and distressing moments of her life, before she attends the ceremony of the unveiling of her portrait at the Prime Minister’s house. The movie’s plot is simple, but is not necessarily easy to follow. This is because whenever Lady Thatcher looks back into the past, she does not do so in chronologically and there is nothing to inform viewers of the year they’re watching. Even for those who are historically fine-tuned, this can be confusing. 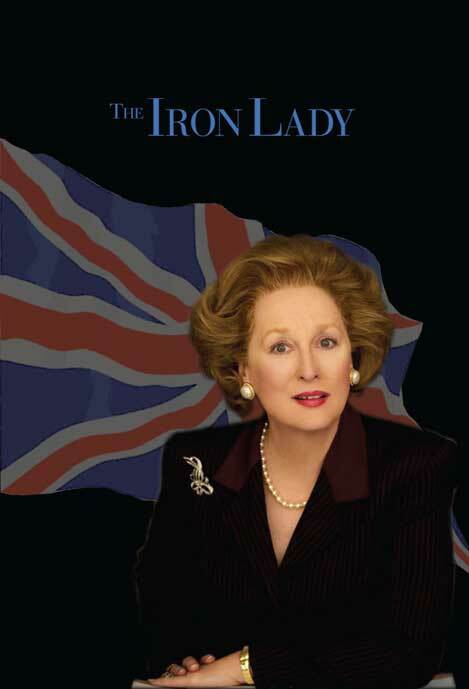 Factually, The Iron Lady is generally accurate; yet, there are several brushes of artistic license in the movie, such as the timing of Denis Thatcher’s (when young played by Harry Lloyd – Jane Eyre, A Game of Thrones, Junk; when old played by Jim Broadbent – Gangs of New York, Harry Potter VI & VII(ii), Cloud Atlas) proposal. Thatcher, as Prime Minister, in a cabinet meeting, telling a colleague that it is not his time to speak. 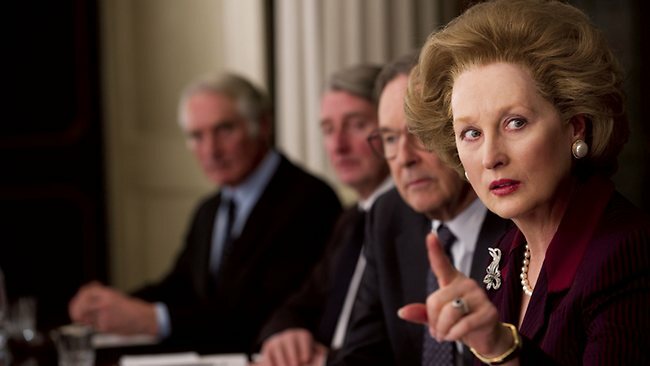 Irrespective of the plot, there is an exceptional performance from Meryl Streep, which makes The Iron Lady worth watching in and of itself. Throughout the movie, Streep seemingly morphs into Lady Thatcher to the extent that one is likely to forget that they’re not watching the real person. 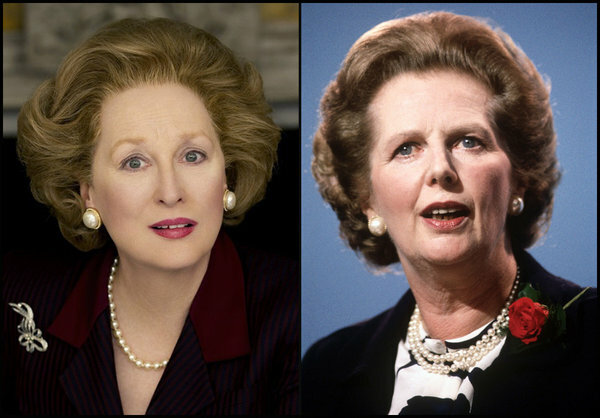 Thatcher in her heyday (right), and Meryl Streep (left) as the brilliant look-alike. It is a shame for Streep that the supporting cast cannot match her display. Alexandra Roach, as ‘young Margaret’, is distinctly average, as are the two actors who play Denis Thatcher, Harry Lloyd and Jim Broadbent. The rest of the cast, particularly Anthony Head (Buffy The Vampire Slayer, The Inbetweeners Movie, Ghost Rider II: Spirit of Vengeance) and Richard Grant (Twelfth Night, Corpse Bride, Zambezia), impersonating Thatcher’s ministers Geoffrey Howe and Michael Heseltine, respectively, play poorly with the little time they have on screen. Head and Grant do not capture their characters’ personalities accurately. Both actors appear as cowardly critics (with eyes brimming with hawkish ambition) of their leader’s policies at times of supposed crises, and Grant also fails to give Heseltine the ego that drove him to resign as Defence Minister in 1986 and challenge for party leadership in 1990. All-in-all, Margaret Thatcher was a formidable individual in her day. She was, and still is, a highly polarising figure for many a reason. Therefore, one would expect a biographic film to be about her achievements and shortcomings as a leader, and perhaps a bit about her legacy too. Yet, The Iron Lady shows relatively little of these, preferring instead to let us watch and pity an elderly lady no longer in complete control of her mind. Despite a phenomenal performance from Streep, the film would be an insult to any human being, let alone one of the calibre of Lady Thatcher. This entry was posted in Based on Real Events, Drama, Political and tagged conservative, cuts, denis thatcher, falklands war, film, golden globe nominated, ira, margaret thatcher, meryl streep, oscar nomination, review, reviews, riots, terrorism, thatcherism, the devil wears prada, the iron lady. Bookmark the permalink. I can guess at your political leanings in the review. Not sure if thats a good thing. You’ve read my review. I think too much focus was on the later years and not much on the politics. I think Thatcher could be humanised even through the political years after all she was human (I think). The interesting story imo is why and what she did in power. Perhaps that was too difficult for Lloyd and the screenwriter Abi Morgan, to make Thatcher look human during the political years because of their political leanings.